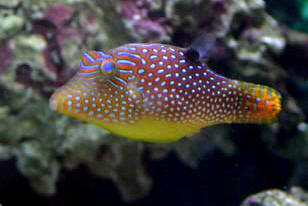 A "false" Toby... look-alike filefish. Toby in a tiny tank Hi! I finally figured out how to ask you guys a question...!!! Alright I have a 25 gallon hexagon tank that I was going to start up as a saltwater tank. I did a lot of research on saltwater aquarium so I think I am ready. The main reason I want a saltwater tank is because of the Valentini Toby. I found half the answers I was looking for on your site but I still had some questions. I read that Tobies are not good in reef tank because they are coral chompers but I also read that they get a long with Tangs and clowns, aren't these fish reef fish...? <Mmm, well, most tangs and Clownfishes are "feisty" and smart enough to avoid nasty Toby bits... but, your system is too small for tangs> How could I mix them if the puffer doesn't go well in the reef setup? <One item... place the puffer, more aggressive livestock last> Do you know any way I could make it so that they could all go together like maybe have a smaller reef to accommodate the reef fish. If I could do that how small can the reef go so the fish will still be comfortable?! Also do you know any other tankmates?!?!!? Sorry for all the questions I just couldn't find the info anywhere. ahh <Keep reading then... till you feel comfortable... The allusion to size... you're greatly handicapping yourself with such a small system... IF you want the Toby... I would stick with just this as your only fish... and keep other non-fish livestock with it in such a small tank. Bob Fenner> Thanks, Ashley. Jactator With Blue Spots http://www.wetwebmedia.com/tobies.htm At this link there is a picture at the top that says a pair of Canthigaster jactators. They look dark with blue spots. What would the LFS know them as to order them, and are they different colors than the blue spots? <Mmm, I made that pic... in Hawai'i... and I suspect that it may look more blue than the animals would appear in a lighted aquarium... Put another way, the nature of film, flash/strobes underwater... might have a great deal to do with the spots looking blue rather than white> I like the colors of the 2 pictured but it seems to be about the only pic I can find like them. Most of the rest are white spotted. I also have a question about the fish I have and would like to have in my 90 Gallon. 6" DSB, Skimmer, sump, lots of flow, 2 21" 65W 50/50 PC Fluorescents 10K. bout 100 LBS of Live rock. Its been going for about 6 months. After it cycled I've added 1 fish each month.. So now I have 1 Yellow tang about 2.5" (He's really grown a lot since I got him!) , 2 clowns about 1.5"(One has slowly gotten a little larger than the other) , and an Orchid Dottyback about 2". All fish eat well and seem very healthy. I feed Formula frozen and dried algae and frozen shrimp every so often. The Dottyback was the last one added and he's been in for 2.5 weeks now. I change about 5 Gallons 2X a week. If I can find this Sharpnose puffer I'd like to make him my last addition.... Before Him I was thinking of added maybe 3 Banggai cardinals and then 3 or 5 Chromis. In your opinion will this be a good stocking level for a 90? or do you think I need to choose between the Chromis and Cardinals. ? <I would likely just have one Banggai... but the rest should be fine. Bob Fenner> Any help is appreciated. Thanks! Bill. Anything compatible with a hungry puffer? Mr. Gonzalez, <Hi, indeed, Lorenzo still hanging out here for a few more days...> I currently have a 30 gal saltwater tank with 25 lbs. of live rock, a 3" semi-DSB, a Prizm skimmer, and a Magnum 350 for circulation. Recently, my puffer (a 3" Canthigaster solandri) has been taking weekly or biweekly bites out of the other fishes' (2 false percula clowns and a six-line wrasse) tails. For their sakes, I took them back to the LFS. Now, my tank seems a little empty fish-wise. I have the puffer, a fat lawnmower blenny that eats Hikari pellets, and a scooter blenny. I kind of rescued the scooter blenny a few days ago (he was in a tank with no live sand or live rock and was being fed flakes, so he was horribly emaciated). I think that he may be too far gone, even though I have a pretty decent population of copepods and amphipods. Also in the tank are 4 red leg hermits, 2 blue leg hermits, <These won't likely last much longer with that puffer around> a curly q anemone, and a chocolate chip starfish. The puffer doesn't seem to notice the blennies or the invertebrates. Anyways, are there any fish that might possibly be okay in with the puffer without hurting him (he is my favorite fish)? < A long-nose of falco hawk might be compatible, and small enough (for a while) for your little 30g system.> Or should I just leave well enough alone? My fianc?and I are setting up his 110 gal tank saltwater as soon as I get out of college (~3 years), so I will have room to move a slow-growing fish out when the need arises. <When you have the bigger tank, you could easily get a trigger, tang, big/burly raccoon butterfly, lion, big angel, etc, that will co-exist fine with your inflatable friend. ;-) cheers! -Lorenzo> Thanks! Question: Can I mix a Valentini puffer with cleaner shrimp or any other types of "clean up crew" invertebrates? I would like to add some shrimp, etc. to help keep the tank clean, but don't want to mix incompatible animals. >> You could, and hope for the best... but there is always the possibility that even this small species of sharp-nose puffer will get hungry enough to try them out. I have had members of this subfamily (Canthigastrinae) in reef systems without incident, but many people relate stories of "cookie" size/shape bites, out of invertebrates and other fishes with keeping Tobies/sharp nose puffers in with their crustaceans, corals.... Bob Fenner, who would still try the Valentini, but make sure it has meaty food in its diet daily... BTW, I saw this species in a reef tank today at the Waikiki Aquarium in Oahu, Hawai'i. Valentini puffer I would like to add a small Valentini puffer (Canthigaster valentini) to my 55 gallon tank .Does this pose a problem for my Anemones, feather dusters and purple lobster. Thank you Richard Tarr >> Umm, likely a Toby, or Sharpnose puffer will cause trouble for the first two... with little chunks bitten out of them from time to time... but the Lobster might well turn the tables and grab/eat your little Canthigaster!